Wow! What a great theme! 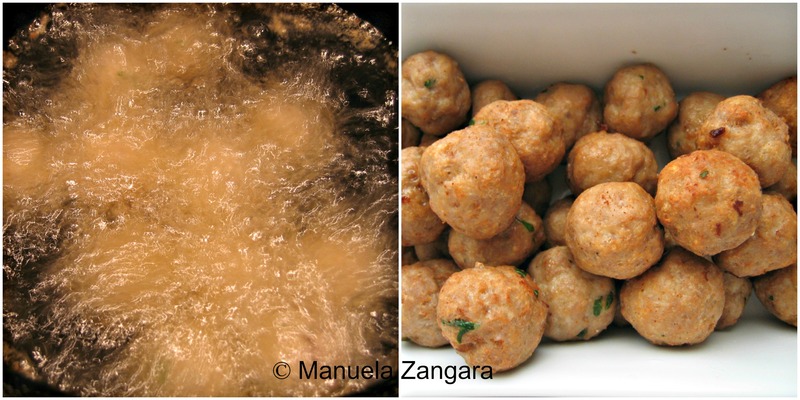 I have always had a thing for meatballs… growing up in Italy, I did eat my fair share. I have a few meatball recipes on the blog already, like my Pork Meatball with Peanut Sauce, or my Stewed Turkey Meatballs, or my Beef Meatballs Agrodolce, so this time I wanted to try something different. The first thing that came to my mind was to make something Italian… but then I thought… that’s what everyone would be expecting of me and there will be tons of Italian meatball recipes out there and I really wanted to do something “different” this time. So… what should I make?? Then I remembered. When I was in Andalusia, many many MANY years ago, I had an amazing dish made with lamb and almond sauce in a small restaurant right outside Malaga’s cathedral. 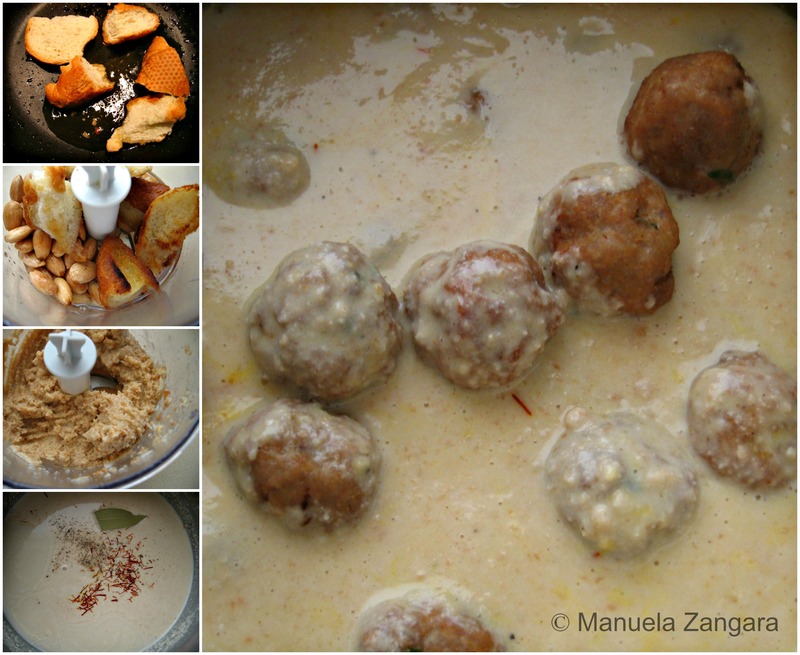 I know that meatballs are very popular in Spain, so I did a little research and I found a few recipes for Meatballs in Almond Sauce and guess what? 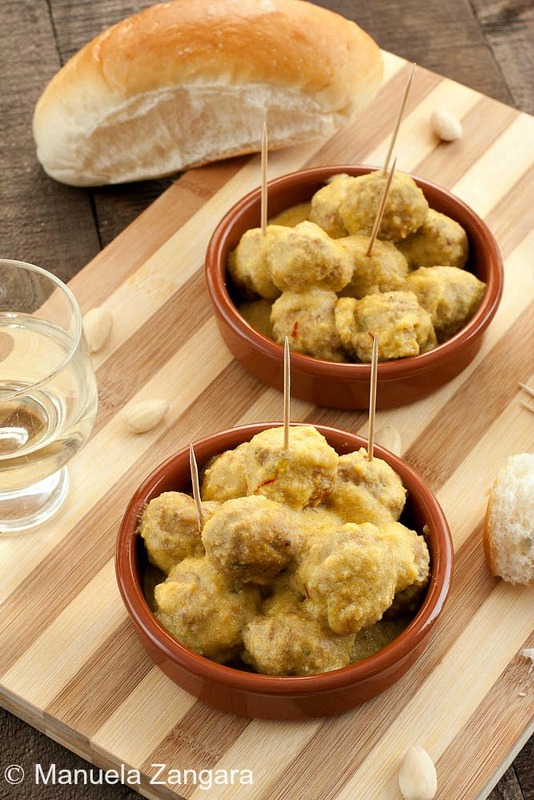 Apparently they are a traditional dish from… Malaga! The final dish actually reminded me of that lamb I had eaten, so I was very happy with the result. 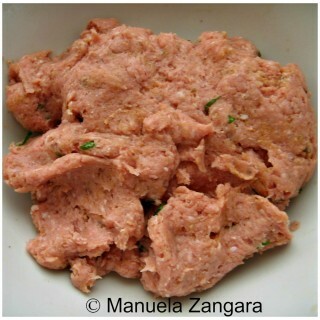 I made the meatballs with pork meat, but you can use beef or a mix of the two if you prefer. Also, I made them smaller than regular meatballs, as I wanted to serve them as tapas with toothpicks to pick them up. They are traditionally served with chips and lots of bread to soak up that delicious almond sauce. Thanks Shelley and Ruth for such a great challenge! 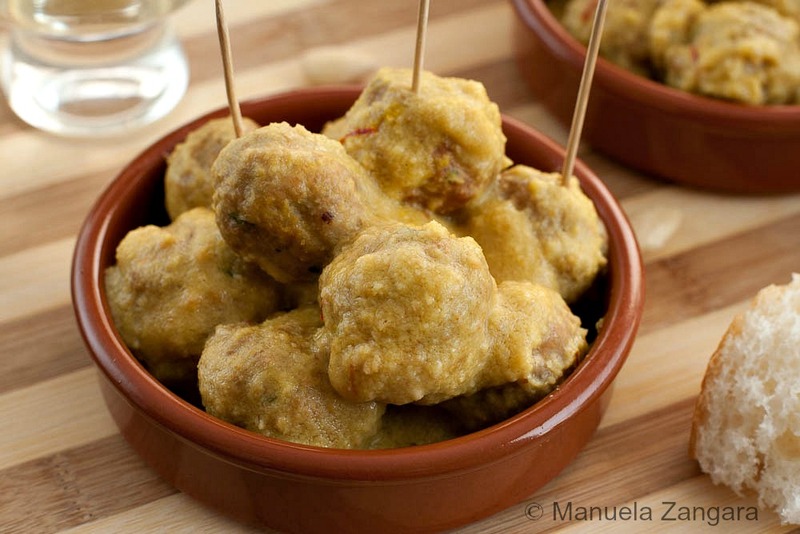 No more talking now, I leave you to it… Albóndigas en Salsa de Almendras. Buen Provecho! 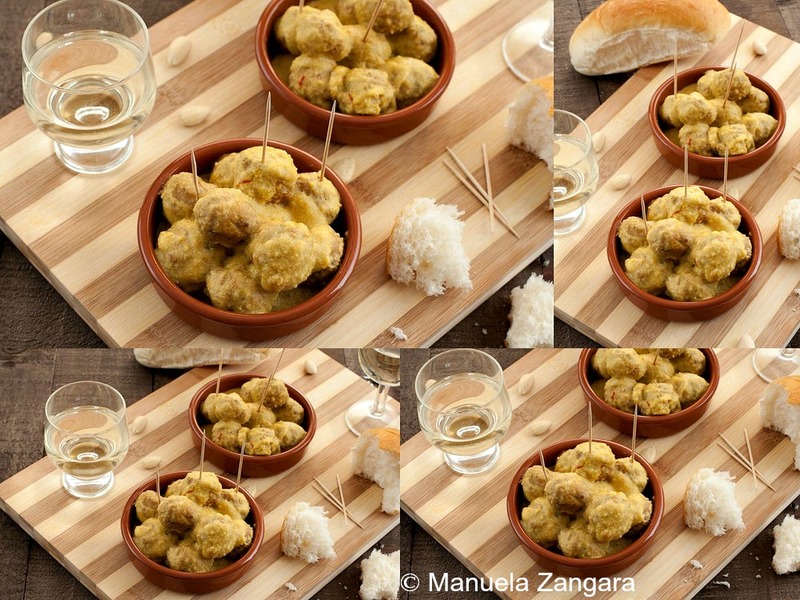 A delicious recipe from the city of Malaga, in Andalusia: Albóndigas en Salsa de Almendras! 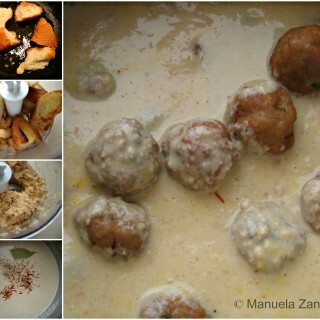 Put all the meatball ingredients together in a bowl and mix very well using your hands. Make meatballs the size of a big cherry and keep them aside. Deep fry them in vegetable oil for a few minutes, until golden brown. Keep aside. Put the Extra Virgin Olive Oil in a pan and heat it on a slow to medium flame. Add the sliced garlic and fry it for a minute, making sure it does not brown or it will taste bitter. Remove it and keep it aside. Fry the almonds in the same way, until just golden and keep them aside. Fry the bread in the same way, until just golden and keep it aside. Put the fried garlic, almond, bread and half the water in an electric mixer and blend it until smooth. Pour this mixture in a big enough saucepan to fit all the meatballs. Add the white wine, saffron threads, bay leaf, salt, pepper and the remaining water. Mix well and put it on the fire. When warm, add the meatballs to the sauce and simmer for 10 to 15 minutes. Make sure you stir frequently as the sauce can stick to the bottom of the pan! Serve warm with some chips and bread. G’day! These look delish, TRUE! I could go for some of these now and congrats completing this month’s challenge too! Yummy. These look mightly delicious. Almonds are seemingly a recurring ingredient in Andalucia, because I made an Spanish almond soup a while ago 🙂 I’ll have to try this recipe in a couple of months. Right now, we’ve had a meatball overdose. 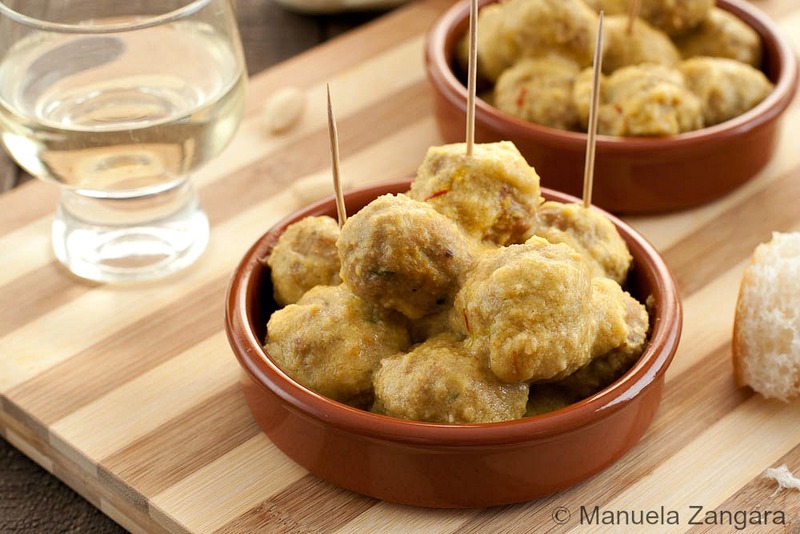 That Almond Sauce sounds lovely, and what a great idea to make small meatballs for tapas. Very Spanish all the way. Delicious! I can’t wait to try the Almond Sauce. Oh, wow, Manu, those look and sound absolutely outstanding. 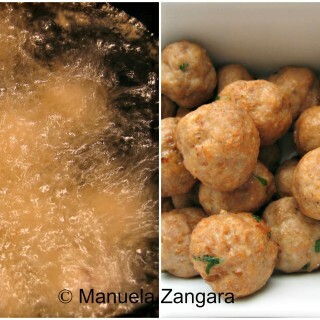 I love that you were able to take inspiration from a great memory and turn it into an amazing meatball. Thank you so much for cooking with us this month! That almond sauce is really a recipe gift – thank you! Am certain it is great with the meatballs, but can think of quite a few other ways in which to use it too!! Interesting idea! I love exploring other Mediterranean cuisines. They use so many of the same ingredients as Italian cooking but in what (for me at least) are unusual and original ways. I’m wondering though why you did not use the lamb (rather than pork or beef) you mentioned in your preface? Lamb meatballs appeal to me however I’m wondering how the almond sauce would go with lamb?? What do you think? This is my favorite meatball. I cooked them this year for a game day appetizer and it was the #1 choice. The guys were really crazy about them and now want them for everything. Great recipe! !